The entire play is about the struggle between truth and illusion, responsibility versus escape. 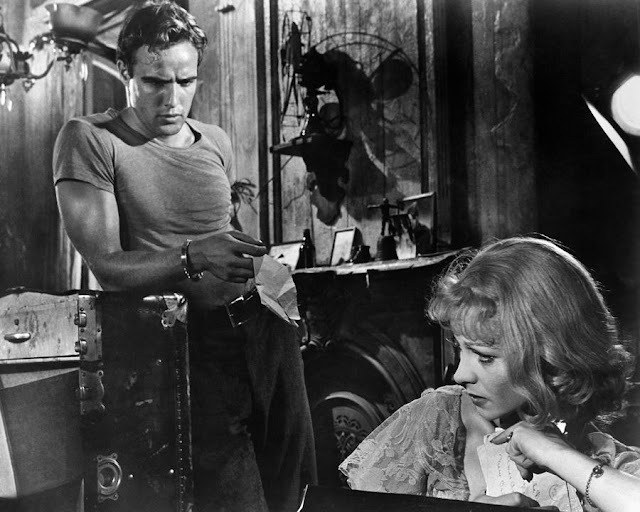 It’s a theme Williams continues in his most famous play, A Streetcar Named Desire, which becomes an all-out war between the cold and violent truth, represented by Stanley Kowalski, and the fragile dream world of illusion represented by Blanche Dubois. Marlon Brando and Vivien Leigh in Tennessee Williams' "A Streetcar Named Desire"
We also see the same conflict in Eugene O’Neill’s The Iceman Cometh, about a group of drunken dreamers who are awaiting the annual arrival of their friend Hickey, the iceman. Hickey arrives, but he is sober, and honest, and he confesses to the murder of his wife. The harshness and violence of Hickey’s sober truth shatters the shallow dreams of the drunks. Truth is again shown to be harsh and violent and destructive, while illusion is shown to be weak and wasteful. These themes continue in almost all great American plays. 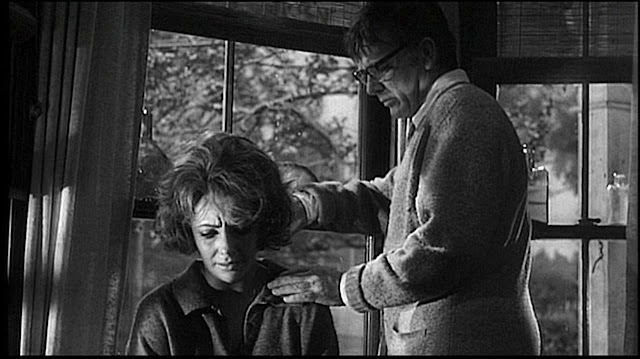 Edward Albee’s Who’s Afraid of Virginia Woolf is about a night with an alcoholic married couple playing a twisted game of deception and lies on their young guests until the light of dawn reveals the tragic truth they’ve been trying to hide. Elizabeth Taylor and Richard Burton in Edward Albee's "Who's Afraid of Virginia Woolf?" Why does this theme show up so often in American theatre? I think it might be because it’s at the center of our history, the core of who we are and who we wish we were. The illusion of America is that it’s that shining city on the hill, where all men are created equal, and where life, liberty and happiness are guaranteed to all, and where anyone willing to roll up their sleeves and work hard can make it. These illusions cover up an uglier truth of genocide and corruption that have, since the beginning, been at the core of our history. It took the Pilgrims who landed on Plymouth Rock in 1620, who came to this country to escape religious persecution, less than four generations before they were burning “witches” at the stake. While the ink was still wet on Thomas Jefferson’s self evident truth that “all men are created equal,” slavery was a major part of our economy and would remain so for another eighty-nine years. Our westward expansion wiped out the natives who’d been here for hundreds of years, through a combination of disease, pestilence and war. It was actually documented government policy to exterminate the great herds of buffalo that roamed the great plains, thus crippling the primary source of food and clothing of tens of thousands of Native Americans. The illusions and the truth of America continue to this day. The land of the free is also the country with the largest percentage of its population incarcerated. The gap between the rich and the rest of the country is widening to cavernous proportions, shattering any idea that all men are created equal. There are sharper racial and class divides and deeper wounds to our psyche. We are the most violent developed country in the world. But we still hang on to the illusion, to its ideals, and every now and then, we make the illusion reality. It was the belief in the illusion that allowed us to join together in World War II and defeat the most powerful evil the world has ever known, it was the illusion that landed a man on the moon, it was the illusion that granted women and minorities the long overdue right to vote, it was the illusion that has allowed men and women throughout the country to marry who they love, regardless of sexual orientation. Every now and then, we hold up our ideals to the mirror of reality and shame ourselves into action. The ugliness of the truth cannot disfigure the beauty of the dream.